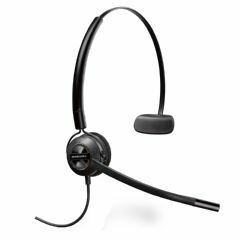 AllegroMedical.com presents the Plantronics EncorePro 540 3-in-1 Headset. Experience the no-compromise flexibility of the EncorePro 540. Its convertible design provides a choice of three wearing styles for personalized all day comfort without compromise of performance. Simplify your headset inventory with a single model that serves multiple user preferences. With tuned wideband audio and a custom noise-canceling microphone you can expect outstanding call clarity.